SCOTTSDALE, Ariz., April 16, 2019 /PRNewswire/ -- At tonight's Nikola World event at WestWorld of Scottsdale, Nikola CEO Trevor Milton gave thousands of attendees a first peek into a global zero-emission future. The event was also live streamed to a world-wide audience via www.nikolamotor.com. 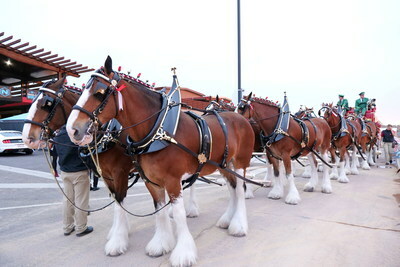 The evening began with Milton arriving on stage by the famous Budweiser Clydesdales, representing the company's iconic client, Anheuser-Busch, that has ordered 800 class 8 zero-emission trucks from Nikola as part of its sustainability strategy. The Nikola Two is the first purpose-build hydrogen fuel cell class 8 truck for long range driving with an optimum powertrain layout. The Nikola NZT was introduced to the Nikola World audience. 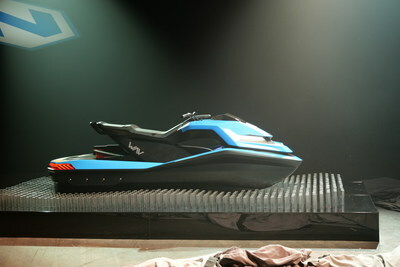 Powersports VP Jordan Darling also presented the Nikola WAV, a next generation watercraft. The Nikola Water Adventure Vehicle (WAV) made its debut at Nikola World 2019. “Nikola is bringing zero-emission sustainability and technology to the water,” said Nikola CEO Trevor Milton. The Budweiser Clydesdales brought Nikola Motor CEO Trevor Milton into Nikola World 2019. 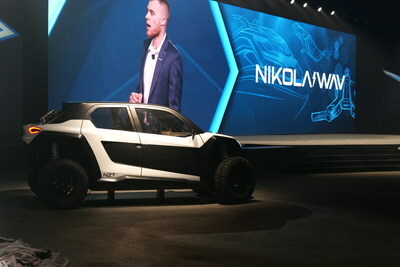 Nikola CEO and Founder Trevor Milton introduced the Nikola World 2019 audience to the Nikola Two. "With virtually no sound and no heat signature, the Reckless provides new meaning to stealth and is defying all standards," said Andrew Christian, Nikola Powersports vice president of business development and defense. "We believe all military vehicles will transform to battery electric and hydrogen fuel cells in the future." As part of the evening, Arizona Governor Doug Ducey discussed Nikola's contribution to Arizona's growing economy, adding 2,000 new jobs at their Phoenix headquarters, planned manufacturing plant and hydrogen and fuel cell R&D center. "The technology and platforms we are developing are mutually beneficial helping us leverage speed to market and scale," said Erickson. "With our powersports products, you have an experience that is safer with precise control and a near silent ride that heightens your senses." Then, for the first time, Nikola World attendees saw the Nikola Water Adventure Vehicle (WAV) concept which has been teased for some time and is now a reality. Jordan Darling, vice president of Nikola Powersports and an industry pioneer in the electrification of personal watercraft, said "We at Nikola are creating the world's first "wakeboard" architecture, which enables us to push the limits in design and propulsion." "Nikola is bringing zero-emission sustainability and technology to the water," added Milton. "With WAV, you can feel the rush of power and acceleration in your chest, with the sound of the water and breeze in your ears. It's zero impact and pure fun," Darling added. Nikola's Executive Vice President of Hydrogen Jesse Schneider, discussed Nikola's hydrogen fuel cell vision. The vision consists of the world's first purpose-built fuel cell Class 8 truck, enabling more hydrogen storage, optimized placement of the powertrain, and a robust 70MPa hydrogen fueling network. "We recently opened our first hydrogen station at our Phoenix headquarters. We are leading the way and working with industry and other OEMs to develop hydrogen standards to enable fueling in less than 15 minutes. The goal is safety and interoperability, so that anyone can fuel at our station. This is a big deal," he said. For the European market, Nikola President Mark Russell and Milton unveiled the never-before-seen Nikola Tre with its clean, contemporary design. "With a range between 500 and 750 miles depending upon load, this gorgeous vehicle will have fast hydrogen fueling in under 15 minutes, even in Europe," said Russell. "Think about Europe with no more diesel trucks," said Milton. "The roads will be clean, quiet and beautiful." At the conclusion of the night, Milton reflected on the small, but mighty, team that started Nikola five years ago in his basement with an idea. "We now have five products in development that will change transportation for the better," he said. 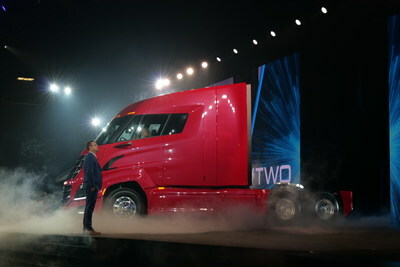 He then unveiled "the most advanced commercial truck the world has ever seen, the Nikola Two." The Nikola Two will be driven on the demonstration track on the second day of Nikola World.